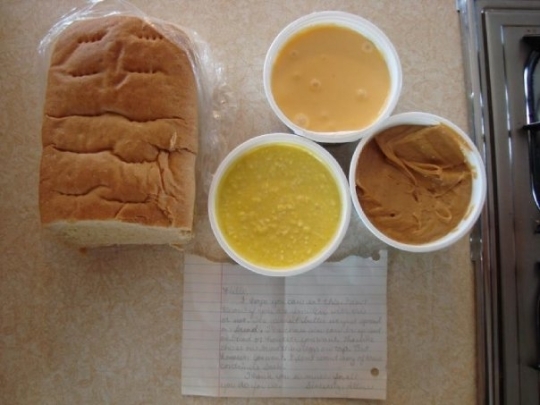 A reader in Illinois shares a photo of 3 spreads given by an Amish neighbor, along with a loaf of bread and a thank-you note. I have eaten 2 of these 3 (tasty). Do you know what they are, and when they’re usually eaten? Ever had some yourself? The peanut butter (right) and cheese spread (top) seemed easiest to identify. The yellow spread was the tougher one, though Mary Yoder got this one right too by correctly calling it an egg spread. I don’t know what they are. Looks like one has peanut butter as an ingredient and one maybe cheese. Not sure about bright yellow one. Maybe some kind of mustard? They all look different, but, I believe they are all Peanut Butter. Two me one looks like a corn spread. Another looks like liver spread (maybe peanut butter) and the the third I can’t figure out. The one on the right looks like the peanut butter/marshmallow spread. The top one looks like a cheese spread and the yellow one at the bottom, I have no idea. Peanut butter spread, cheese spread and corn spread; all served at the Sunday church meal. Left [yellow one]: I’m waiting for the answer on that one! Left: It looks like corn. Would it be Kumquat Jam? Just a corny guess. I tried to magnify the note to look for clues but I couldn’t read it. One of them must be peanut butter. The others I do not know. Maybe some kind of cheers spread. Are you going to take the suspense out of all of us and let us know what they really are. Please………. Sorry Ellen, answers coming soon 🙂 Just to give later-in-the-day readers a chance to have a look. Some good guessing going on here. Think one is peanut butter, sweetcorn mash, and apple butter?. Could be totaly wrong. When you announce the correct guess, would it be possible to include a recipe for the correct spread, for those who are inclined to try their hand at making up some. My favorite thing about the whole photograph is the note. The note-writer appears to have torn off the “clean” bottom half of paper to use for a note. How authentically Amish!! Thank you Erik. I wondered what they were. My guesses were way off. Really enjoyed this. I missed this yesterday, but wouldn’t have guessed the egg one (cheese and peanut butter/marshmallow, yes). Beautiful handwriting—very feminine…something you don’t see often enough these days, with cursive writing no longer being taught in many schools. I remember my classmates and I (all girl school) practicing to “perfect” our signature. I’d hate to see that “skill” (“art”?) fall by the wayside because of computers/technology. 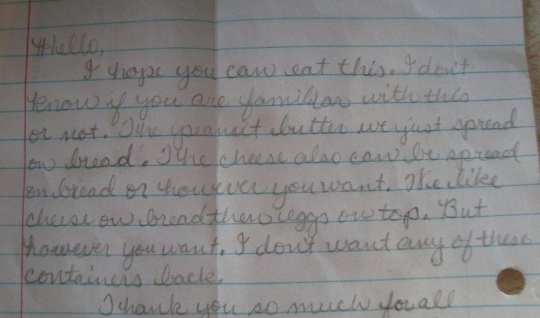 Letter says are yogurt butter–for bread. Peanut butter spread and cheese spread that they like with an egg.